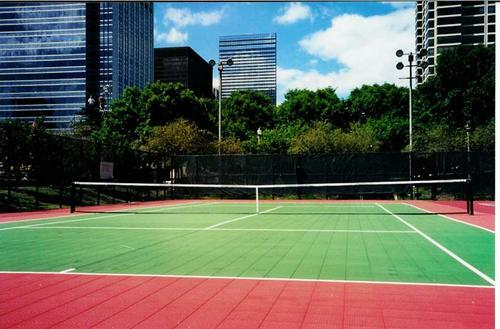 In addition to basketball, roller hockey and tennis court installation, the commercial tennis court flooring experts at Flex Court of New York also offer professional resurfacing services for courts of all ages. Regardless of whether it's an indoor or outdoor court, wear and tear is to be expected. In certain cases, cracks and chips on your court can get larger over time, potentially leading to injuries. This is especially true if there are extreme weather changes over the years. A handyman or sports court painter isn't the best choice when it comes to restoring a concrete or asphalt tennis court to its former glory. In contrast, Flex Court's Long Island tennis court resurfacing team is specially equipped for such tasks. Our orthopedically designed tennis court surfaces have built-in flexion, so they perform in all weather conditions. ¾ inch-thick shock absorbent co-polymer surface delivers unsurpassed traction and reduces the risk of ankle and back injuries. We offer a range of colors and our surfaces typically boast a 25-30 year life expectancy. Our all-weather tennis court surfaces are endorsed by U.S. Open doubles champion Jonas Borkman. The International Tennis Federation (ITF) has deemed our court surface perfect for competitive backyard play. Approved by the United States Tennis Association (USTA), our courts come with a 15-year warranty. For most tennis enthusiasts, it can be tremendously frustrating trying to play on a residential court that has seen better days, and that is where we come in. Contact the New York tennis court resurfacing specialists at Flex Court today by calling (631) 753-0003 for more information. Alternatively, you can also contact us online to talk to our team about a free design consultation!